When I was 16 years old I completed my first Black Belt test at Upper Darby Karate & Kickboxing, which is located on the 2nd floor of the Upper Darby firehouse in an old-school boxing gym. I started training at 12 and consistently trained 4+ days a week for four years. 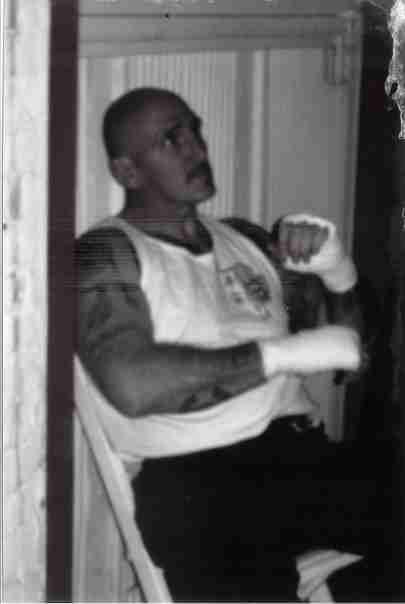 The gym housed boxing for over 20 years before Andy Carr started the martial arts school. I joined a few months after classes started, so I was part of the school’s 1st Black Belt Test. Andy had a penchant for over-the-top training methods for fights and our belt tests, so we expected a weekend of hell. Many psychological studies shows that victims of abuse are more traumatized by the anticipation of the abuse than by the actual event itself. We had this same mindset, and so we did what we were trained to do. We prepared for the worst. This is the entrance to the UD Gym, my other home. If you want to see the inside, click the picture and pause the video at the 1:59 mark. You can see the 3 different corners of the ring, where I slept for my 3 Black Belt tests. The long days may seem the most challenging, but for me the weight lifting was painful. I was weak and it was hard finding the motivation to get started. I fought my mind to keep my commitment. At times I lost, but often I won and I learned that preparation and persistence are the keys to success. While I wasn’t good at weight lifting, I was very confident in my kata, which is a practice of pre-determined sequences of karate techniques. One of my training partners for the test, Jimmy Jones, offered to help me learn some weight lifting routines if I’d work on kata with him. That’s why our Sunday sessions were so long. We had a lot to cover. As a teenager getting to the gym by 9 am on a Sunday morning was also painful, but we both felt better prepared for the test from these sessions. Jimmy also helped me train for my first kickboxing fight in the Spring of 1996. When training for my fight, the weekly schedule above continued, but I typically spent our Black Belt classes completing our fight training workout, while others worked on their kata and advanced kicks. The fight training workout was grueling as you can see below. That’s typically a 1.5 to 2 hour training session and this was done 4-6 days per week for 6-8 weeks. The most difficult part of the fight training workout is Sparring, which is a simulated fight. When training for a fight, Sparring is more intense as your training partners try to imitate what you’ll face in a real fight. Competing in a fight is the most intense environment and stress on your body that I’ve ever experienced. I can’t imagine anything worse in life short of bullets whizzing by your head or a knife lunging towards your gut. To combat the adrenaline that accompanies fighting, you must train both mentally, physically, and spiritually to have a singular focus on your objective of winning the fight. Adrenaline provides a brief boost by causing your body and mind to go into overdrive for about 1 minute, but is followed by fighting through 10 minutes of hell. The adrenaline bottoms out and you feel 100 angry skeletons pull your arms and legs beneath the ring with a heavy ball and chain, while pumping your heart and lungs so fast they’ll explode. This is why I learned to meditate. This is my teacher, Andy Carr, before his last fight at 49 years old. If you can grasp the intensity in his eyes, you’ll have some understanding of what it feels like before a fight. My first kickboxing fight was underwhelming. I was five pounds underweight from not eating due to nerves. My scheduled opponent was twenty pounds overweight. In the heavyweight division, they’d let you fight despite this enormous disparity in size. In the teenager 155-lb division, they wouldn’t let us fight and I was out of luck…or so I thought until my trainer partner Jimmy Jones volunteered to fight me. That might not make sense to non-fighters. In fact, it doesn’t make sense to a lot of fighters either. Many training partners from the same gym vow to never fight each other. Fighting gyms are like families and your training partners are your brothers. At our gym we know: Brothers sometimes fight. Not only do they fight, but they’re stronger for it. Some of the strongest bonds I have are with people that I’ve fought. Jimmy Jones, who I’ve seen only once or twice in the last ten years, is one of those people. If he asked me for something to this day, I’d do it. That’s our bond and it started in our Sunday training sessions and was cemented in my first fight. Jimmy and I actually made a vague agreement before the fight that I wouldn’t knock his head off with my roundhouse kicks if he wouldn’t smash my skull with his thunderous hooks. Writing that feels like we were scripting a pro-wrestling match. I still threw my kicks and Jimmy still threw his punches, but we wanted to survive in relatively good condition for our Black Belt test, which was just a few weeks away. I won a close match by controlling the distance between us. When I started sparring with Jimmy, who is about five-and-a-half feet tall, he towered over me. By the time I turned sixteen, I already had a few inches over him. My reach advantage combined with some good footwork and long, straight punches and kicks allowed me to execute my standard outside fighting game-plan, but not without receiving some body-collapsing punches in my gut. That wasn’t anything I hadn’t been prepared to handle. I’d envisioned the fight hundreds of times in the months leading up to it. I saw everything that could go wrong, but I always saw myself fighting back to win. Jimmy and I hugged afterwards and marched forward with our training starting the next morning, since it was Sunday and we always trained on Sunday. It was Memorial Day weekend – 1996. We arrived Friday night at about 6 pm. The test would start at 7 pm and we had lots of food and gear to unload. There were seven of us: Jimmy Jones, Shawn Luther, Mike Krauss, George Sunny, Bobbi Ann Sunny, Bob Walters, and me. There was a nervous tension in the air. We were told the test would be completed on Sunday if things went well, but that we might have to stay through Monday. We were told not to expect much sleep, breaks, or mercy. Let the torture begin. By Sunday morning of that weekend I could not raise my knee up to hip-level, which for me who can normally kick over his head, was a major sign that my body was broken down and that I wouldn’t have my normal weapons for sparring. I survived. When I went home, I collapsed on my bed for about 6 hours during the middle of the day. I remember whenever I had to turn myself over, I had to grab onto something with my hands and pull to rotate my body, since I couldn’t do it with my hips. I had no strength left. It took a week for my body to get back to normal. We received our Black Belts at a special presentation complete with fancy certificates and applause from the crowd. Over the years I often lost my belt and I think my certificate died when I moved from Lansdowne. What matters most to me is the preparation that went into surviving that test and the depths of my spirit that were challenged when wanting to quit several times that weekend. It taught me more about myself than any experience I will likely ever have and I liked what I found. The amount of focused effort you put into an activity is proportional to the benefit ultimately derived. Getting a belt doesn’t mean that much to me, but building a set of physical, mental, and spiritual skills that I can use at any time is invaluable. Courage, leadership, self-discipline, equanimity, and a decent right cross come in handy in many difficult situations in life. Those benefits were gained from hour-after-hour, day-after-day, and year-after-year of intense, deliberate practice totaling 2000 – 3000 hours over my first four years of training. That includes approximately 1000 hours of mental reps. Yes, I was that crazy, but that’s a different lesson learned. Visualizing your future is an invaluable technique for achieving your goals. I understand this much more now than I did at the time of this test, since I’ve been able to successfully apply visualization to work, school, my marriage, and many, many goals. Setting a well-defined goal by writing it down, reviewing it regularly, and visualizing the process of achieving the goal naturally summons the resources within and around you to make the goal a reality. Most people don’t achieve their goals, because they won’t formally acknowledge and commit to them. Once you do, you’re motivated consciously and unconsciously to not let yourself down. It is scary supercharging success. Tremendous confidence flows from knowing you can’t be broken. Completing the test described here was tortuous, but I imagine there are much more difficult circumstances in life: Navy Seals Hell Week, living homeless in a cold Minnesota winter, actual torture. I can’t say definitively how I would fare under those circumstances, but I know there are very, very few situations in life, in which I wouldn’t have complete confidence that I would survive. I’ve been there. My brain has been trained to choose the right path, even if it’s physically painful, mentally more challenging, and spiritually foundation-shaking. Knowing that gives me a fountain of confidence in my character and my decisions. It ain’t about how hard you can hit. Its about how hard you can get hit, and how much you can take, and keep moving forward.